PHUKET: The first week back from the Songkran break was a busy one at the British International School Phuket (BIS). Scottish artist Mrs Evans looks over her students’ work. On April 26, more than 200 students in a convoy of white mini-buses converged on Nai Harn Beach to help clean the beach of debris left following the busy high-season. Students separated into groups to start work at both ends of the popular tourist beach. Students piled bags of rubbish, to be collected by the municipality and transported to the Phuket incinerators and burned. 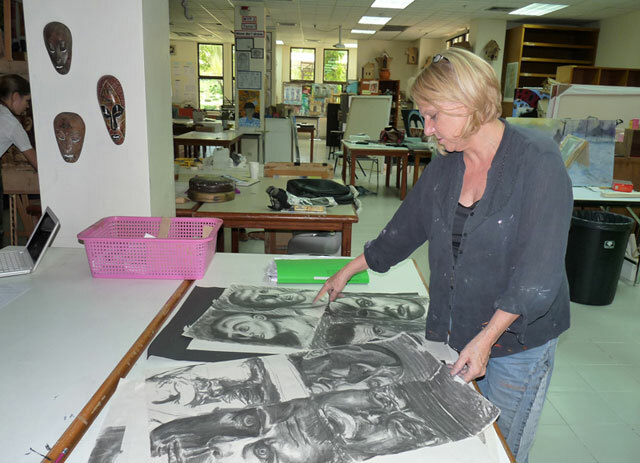 BIS secondary school art students were also hard at their creative work that afternoon, being guided in their studios by two artists in residents, Scottish artist Elsie Evans from Bangkok, and Boonkasem Sae Kow, painter and Director of the Krabi Contemporary Art Museum. Boonkasem, who paints abstract landscapes, was urging his students to make the art that they enjoy. One benefit of making art is the pleasure, that also makes their art better, he told his students.